Everytime i launch up crossfire with process lasso, it doesn't launch. And when i check task manager it would get instantly gone and it shows this http://imgur.com/a/UQZR5. Is this something with prioritizing or restraining the program from launching? if it is, can someone help me how to fix this? Your image link is broke, but did you setup the game in game mode, is it a Steam game ? You can try setting the process to exclude from probalance restraint, that might help if it has some kind of tapper protection. To set a process to be excluded, easiest way is note running processes and start game or any app used with it. It PL GUI process list, find these game processes and right click on the processes and scroll down menu to "excluded process from PL restraint". Do that on all the ones you want and they will be added to excluded list and you should see X in the process rules column. The screenshot seems gone now, can you repost please? I am not sure what is going on here, but maybe it's some Game Anti-Cheat stuff... sounds a bit bizarre. I do have a report and minidump of an Arma3 related issue that I am investigating. I don't know if it has any relevance here, but I will keep you updated. And note that Process Lasso will never block (or crash) any external application unless you tell it to terminate that app or have a problematic rule set (all default rules are entirely safe/fine), so I really need more data about how you even think there is a correlation to proceed on this investigation. That screenshot may help, so please let me know. Apologies for taking a few days, I didn't see this post right away. The link in this post seems to work for me. Maybe you have a temporary network issue? Here is a copy in text form of the first paragraph in the Crossfire wiki. 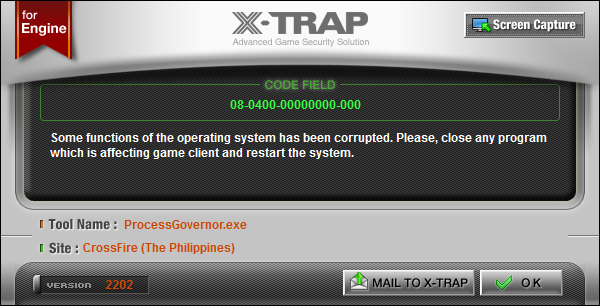 "X-Trap is an anti-cheating program created and maintained by WiseLogic, used in almost all CrossFire versions to prevent players from using hacking tools. Like anti-virus programs, X-Trap is launched along with CrossFire and continue manipulating memories while CF is running to detect suspicious processes that try to interact with crossfire.exe. If something goes wrong, X-Trap will close CrossFire and give out an error message, telling players the possible reasons and general suggestions to fix it. Accessing process viewers, like Task Manager, is also counted as suspicious activities (This is X-Trap's self-defense module to avoid being "killed"). Though not as effective as many people think, X-Trap is actually better at detecting and blocking hack tools, some that GameGuard can't detect which was the previous anti-cheat program for CrossFire. Naturally, hack tools are updated faster than X-Trap because hackers are everywhere, and they have more resources and have more time, while WiseLogic must work on updating their X-Trap for every publisher, so X-Trap often falls behind when coming to updates. However, X-Trap is still a necessary tool to help protecting CF against popular and public hacks, which many people may use for free. " Of course PL would trigger this as it is a "Process Viewer". Thanks! Please be patient and I'll give you my analysis ASAP. I am going to repost that image so we can all see it more clearly. It appears that Process Lasso is not compatible with this X-Trap application since X-Trap believes Process Lasso is 'corrupting' the OS since it is looking for cheating or cracks. In other words, it detected Process Lasso's core engine taking action on external processes and said "Wzup with that?". With some research this can most likely easily be fixed, so I'll begin on that.